I follow the work of Mark Changizi on vision. Previously I mentioned one of his early papers on this subject, “Harnessing vision for computation” . One of the applications of computing with space could be to SHARE THE SPATIAL EXPERIENCE ON THE WEB. So I posted the following comment: Is your library my library? “Good point, but you have converted a lot of time into understanding, exploring and using the space of your library. To me the brain-spatial interface of your library is largely incomprehensible. I have to spend time in order to reconstruct it in my head. In the section 2.7 (“Spacebook”) of the paper on computing with space I mention this as an intriguing application of this type of computing (the name itself was suggested by Mark Changizi after I sent him a first version of the paper). Nice! But in order to do a spacebook we need first to understand the primitives of space (as represented in the human brain) and then how to “port” them by using the web. I continue from the previous post “Curvdimension and curvature of a metric profile II“. Let’s see what is happening for , a sufficiently smooth ( for example), complete, connected riemannian manifold. The letter “ ” denotes the metric (scalar product on the tangent space) and the letter “ ” will denote the riemannian distance, that is for any two points the distance between them is the infimum of the length of absolutely continuous curves which start from and end in . The length of curves is computed with the help of the metric . Notations. In this example is a differential manifold, therefore it has tangent spaces at every point, in the differential geometric sense. Further on, when I write “tangent space” it will mean tangent space in this sense. Otherwise I shall write “metric tangent space” for the metric notion of tangent space. Remark 2. The smoothness of the riemannian manifold should be just enough such that the curvature tensor is and such that for any compact subset of , possibly by rescaling , the geodesic exponential makes sense (exists and it is uniquely defined) for any and for any with . Let us fix such a compact set and let’s take a point . Recall that the sectional curvature is defined for any pair of vectors which are linearly independent (i.e. non collinear). Corollary 1. For any the metric space has a metric tangent space at , which is the isometry class of the unit ball in with the distance . Proofs next time, but you may figure them out by looking at the section 1.3 of these notes on comparison geometry , available from the page of Vitali Kapovitch. Via this post by John Baez “Research Work act Dead – What Next?”. The memorandum proposes to faculty members to, roughly: make sure that all papers are accessible, try to submit to open-access journals, “if on the editorial board of a journal involved, determine if it can be published as open access material, or independently from publishers that practice pricing described above. If not, consider resigning“, and so on. 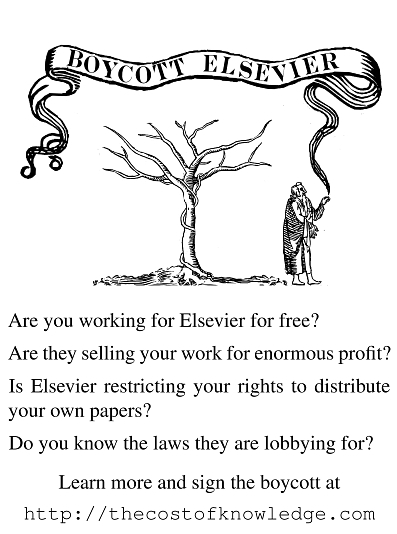 They are NOT targeting Elsevier, instead they write: “many large journal publishers have made the scholarly communication environment fiscally unsustainable and academically restrictive”. Well, even officially it begins to be obvious that the emperor is naked. This continues the previous post Curvdimension and curvature of a metric profile, I. Definition 3. (flat space) A locally compact metric space is locally flat around if there exists such that for any we have . A locally compact metric space is flat if the metric profile at any point is eventually constant. Carnot groups and, more generally, normed conical groups are flat. Question 1. Metric tangent spaces are locally flat but are they locally flat everywhere? I don’t think so, but I don’t have an example. Remark that the set always contains . Also, according to this definition, if the space is locally flat around then the curvdimension at is . We are going to see next that the curvdimension of a sufficiently smooth riemannian manifold at any of its points where the sectional curvature is not trivial is equal to .